Inglenook pattern and operations, check out Adrian Wymann’s website, Shunting Puzzles. Finding himself at loose ends and looking for a new layout opportunity, well-known English modeler Colin Peake decided to try out a “layout in a box file” … box files being sturdy cardboard cartons that hold correspondence files in British and European offices. They measure about 10x14in (25x36cm). 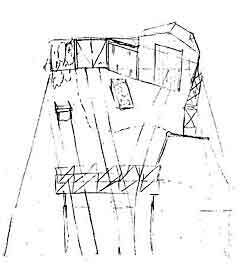 Colin’s initial planning sketch is shown at left. 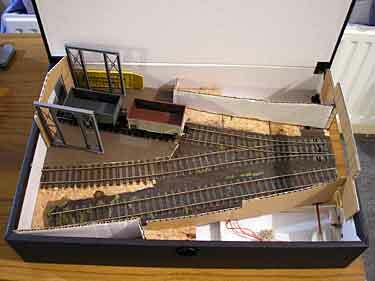 The track plan is Inglenook Sidings fed by an offstage sector table that is bolted onto the basic box file. This little line is OO scale (4mm to the foot on 16.5mm gauge). Besides providing opportunities for enjoyable shunting action, this tiny layout also provides Colin with a surprising scope for adding the scenic details that are his modeling trademark. Some of these “touches” are shown here, and there are many more photos and lots of information at the layout website. OPERATING A TYMESAVER LIKE AN INGLENOOK! The other diagram (above right) shows the bare bones of a traditional “terminus to fiddle yard” layout that also operates in the Cox mode, adding an additional puzzle element to a standard track plan. Add additional spur tracks to taste (and a fiddle yard at upper left), and you have an effective layout with a special Inglenook twist! The plan shown is drawn with Peco Streamline Medium turnouts and Set Track components. A REAL-LIFE INGLENOOK IN AUSTRIA … WITH GRAVITY SWITCHING! Herbert Fackeldey, from Aachen, Germany, sent along these photos of a real-life Inglenook track arrangement at Fulpmes, an Alpine ski resort in Austria (track plan below). 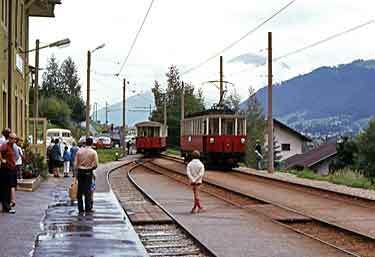 Herbert comments, “The metre gauge Stubaitalbahn, despite being a line of the Innsbruck streetcar (their longest one at about 20 kms), is every bit a mountain railway with heavy grades, sharp curves and towering bridges. All shunting at Fulpmes was done by gravity, taking advantage of a considerable grade starting at the level crossing. Gravity shunting (switching) adds a whole new dimension to Inglenook activity! Although freight (goods) traffic was discontinued in 1979, a model Fulpmes could find a way to continue it. 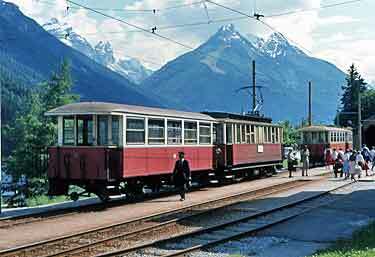 When Herbert took these photos, this line from Innsbruck was equipped with 1904 AC rolling stock. DC streetcars from Germany were obtained in 1983, and the line is still active bringing skiers from Innsbruck to the slopes near Fulpmes. A number of detailed photos of the present-day terminus are available online. The gravity switching, coupled with breathtaking scenery, makes this line eminently modelable — and for operations, it’s an Inglenook! 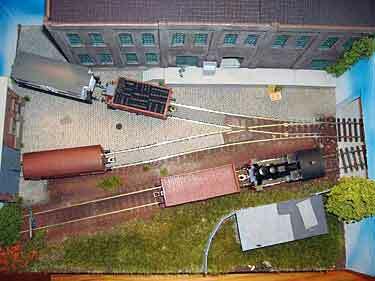 Dave Humphries, from East Sussex, England, is building a 4x1ft (120x30cm) Inglenook layout in OO scale. In order to show off his collection of shunting locomotives, he’s added a locomotive storage siding and is considering a hidden fiddle yard to the left. An arriving train is pushed into the sidings by its loco, which theoretically has run around it farther up the line. The arriving loco heads back offstage for servicing, and a local switcher takes on the shunting chores (using a card system). YOU CAN BUILD SPECTACULAR SCENERY ON YOUR INGLENOOK, TOO! Fulpmes, in the Austrian Alps (described above) is not the only spectacular scenery for an Inglenook. Rex Beistle, from “In the shadow of Longs Peak, in colorful Colorado USA,” is building this spectacular Inglenook, set in the Rocky Mountains of the US West, in a 77x19in (196x48cm) space in HO scale. Rex plausibly describes Hilltop Station this way: “There is very little room for the railroad at the place called Hilltop. The rocky canyon narrows approaching the summit of Rock Pass, leaving just enough room for a couple short spur tracks and the tiny little town. The operating crews use the short tracks to hold a few cars as they double the steep hill. The railroad’s general agent and pump tender lives in the otherwise unused freight room in the back of the depot. The three times weekly train stops to deliver the small bit of express shipped by the big catalog store in Chicago. “I received a message from Will Ayerst asking if it were possible to do a 3:2:2 Inglenook without turnouts, like Shortover Yard, but without the head shunt being hidden in a tunnel or building. While thinking I was suddenly struck by a piece of blinding inspiration. Build it the wrong way round! “The headshunt is on the dockside and the float bridge, and the traverser is a ferry/barge that takes cars across the river (as in New York). Like most of them the barge is warped (pushed) by a tug sideways to line it up with the onshore tracks. Voilà! No tunnel and a reason for having three tracks moving sideways with a fixed, but visible, head-shunt! “If you can get a 44- or 70-tonner that would be the ideal loco for the job. Backscene is the river with skyscrapers in the distance, for example here, and the background on the dockside is a warehouse with a track in front, set into the concrete and a car or two that don’t move either! If there is room, fit a tug on the side of the barge so that it is slightly above the water surface and moves with the barge/traverser but hides the traverser rails. “And another flash of inspiration! As I was looking at it, one of those pesky Wotifs came and whispered in my ear (drawing below). This is no longer a micro design, but I thought it would be interesting as a two loco DCC with sound operation. One loco parks on the loco-spur and sits there ticking over whilst its mate works shuffling the carfloat barge. Then they swap round to switch the yard.” As Jack would say, voilà! HOW SMALL CAN A SATISFYING INGLENOOK BE? This is a very large subject, but I will tell you some basic information about it. For a more complete discussion, see Adrian Wymann’s excellent site on Shunting Puzzles. The classic Inglenook puzzle requires three sidings with 5-3-3 car capacities. As it happens, I introduced the subject of reducing the size of the Inglenook puzzle in my book, Creating Micro Layouts, pp. 34-35. To measure their “difficulty levels” I invented a scale from 1 to 10, with ratings depending on how many seconds or minutes the average person requires to solve a typical puzzle. Level 1 is the rating for puzzles that require only a few seconds to solve (a 1-1-1 arrangement, for example). Level 10 denoted puzzles that required more than 7 minutes to solve, on average. The scale is logarithmic, so a 5 level requires 1 minute to solve. The testers’ general opinion was that a level 5 puzzle was the minimum that would provide lasting entertainment value. The experiments resulted in a determination that the “smallest and simplest layout” that provided a difficulty of Level 5 was the 3-2-2 arrangement, with a head shunt (drill track) holding a loco+2 cars and 5 cars distributed over the 7 open spots. For exhibition purposes, the task would be to assemble a 4 car train in a pre-determined car sequence. The drawing (above right) illustrates this minimum-sized Inglenook, a 3-2-2 arrangement that fits on an A3 sized sheet of paper (about 11¾x16½in). For home use, a better, Level 6 arrangement would be 4-2-2, with six cars and two open spots. The task is to assemble a 4-car train. An example (at right) is my Ginglenook Jr. layout, a G scale switching line that fits in a 6x2ft (180x60cm) space (for track plan and discussion, see Scrapbook #38). Solving this one sometimes requires uncoupling on the second turnout and leaving a car fouling the turnout. If that bothers you, then the head shunt should be a loco+3 cars. Increasing the outbound train to 5 cars can also greatly increase the frustration level of solving the puzzle! 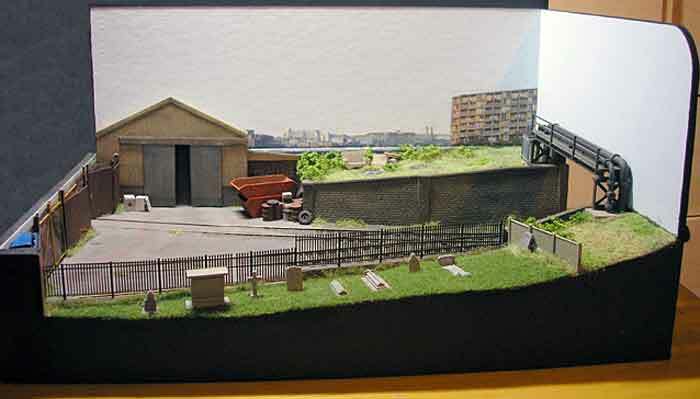 Gavin Sowry, from Wellington, New Zealand, has built and exhibited this layout (see Scrapbook #42a) and reports it’s a “head scratcher” for many exhibition-goers. That’s the minimum size. To the best of my knowledge, no work has been done on sizes larger than the classic 5-3-3 with a loco+3 head shunt and 8 cars available. I suspect that the combinations of possibilities are so large that almost any arrangement would provide a challenging series of puzzles. Marc Witten, from Caine, Wiltshire, England, built his On30 3-2-2 Inglenook in a folding box that measures 8¾x24½in (22×62 cm) overall. This was a “quickie” project built for an exhibition. The box folds in half to be a self-contained carrying case. 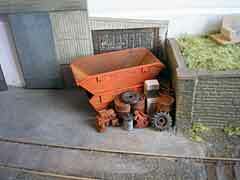 Rolling stock is Bachmann Porter, 3 side dump cars and 2 V-skips. How elegantly simple! From a scenery point of view, notice the dummy siding along one edge of the baseboard — a good place to stash extra locos and provide a busy, active look to the yard! The project challenge is to develop an Inglenook Sidings switching puzzle, 3-2-2 pattern, in O scale standard gauge (32mm or 1¼in), using Atlas O two-rail track components. The layout has to accommodate an RS-3 road diesel locomotive, and each leg must hold a 50ft car plus one or more 40ft cars. The whole thing should be portable (simple, rugged, light) and represent a believable locale that features industrial scenery. It should also include a car ferry dock and use cassettes for the ferry and for the switching lead (head shunt). Such a layout makes an excellent beginner’s project in two-rail O scale. The controlling dimension is the length of a cut of three cars, one 50ft and two 40 footers — a total of 40 inches in O scale. So the switching lead length will be 40in plus the length of the locomotive. Cassettes for the car ferry will be 40 inches long. A reacher car might be needed to keep the weight of the locomotive off the car ferry and the moveable apron (that compensates for tidal height variations). A prototype location on non-tidal waters could eliminate the need for an apron, so the switcher could go right up to the ferry to drop or retrieve cars. For this layout design, we’ll choose a prototype location near the north end of Chesapeake Bay (a minimum-tide area) on either the Eastern or Western Shore. Let’s call it the Cross Bay Transfer Company (CBTC), a subsidiary of the freight-only Canton Railroad that serves customers all around the Baltimore waterfront. 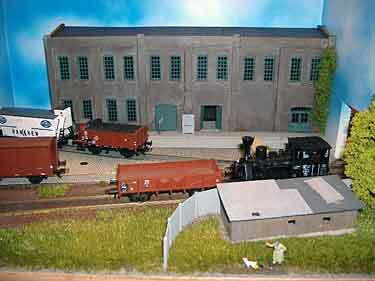 The modeled area includes a car ferry exchange, a warehouse, a factory, and a small engine servicing facility (converted from coal to oil) and a bulk liquid fuel transfer point. The basic operating scheme involves shuffling cars on and off the car ferry using Inglenook Sidings rules on the 3-2-2 arrangement. The photo (at right) shows a mockup of a rock-bottom minimum-sized 3-2-2 Inglenook Sidings arrangement that can handle one 50ft car plus 40ft car(s) on each track. Yardsticks adjacent to the tracks show the sizes needed to accommodate this track arrangement. If the head shunt (switching lead) were on a traverser the entire arrangement could be developed using only one turnout. The image shows two cars plus a Yoder 25-ton switcher on the head shunt, which could be lengthened to accommodate 3 cars (one a 50ft car) plus any locomotive. 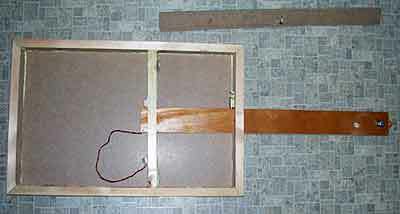 The next mockup (right) shows the basic track arrangement developed using standard Atlas 0 scale two-rail components. The full length of the shorter legs of the Inglenook Sidings is not shown but would be off to the left on a car ferry cassette. The mockup shows an unmodified Atlas wye turnout (which produces a 4½in track center-to-center spacing) feeding the car ferry. One or both legs of this turnout can be trimmed to bring the car ferry tracks to 3¾in center-to-center spacing. This photo shows three 40ft cars on the longer leg of the Inglenook Sidings. That track can accommodate a 50ft car in place of one of the 40-footers. The lone car is a 50-footer, placed to show the ample clearance available. The turnout at the upper right forms the start of the head shunt. The kickback track at the lower right leads to the locomotive servicing facility and bulk fuel transfer industry. This adds a bit of complication to the switching chores since there is no runaround track on the layout. As a further complication, the RS-3 and a freight car can’t clear the turnout under the 50ft car unless the locomotive can put some of its weight on the ferry. A shorter locomotive, such as the Yoder 25 ton, could switch that car easily. The final plan (above) is drawn using stock Atlas O components, including a shortened wye turnout. 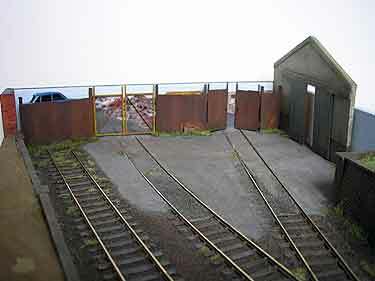 The basic layout fits on an 1½x7½ft platform (shown with orange lines), with cassettes used at the car ferry and at the head shunt. 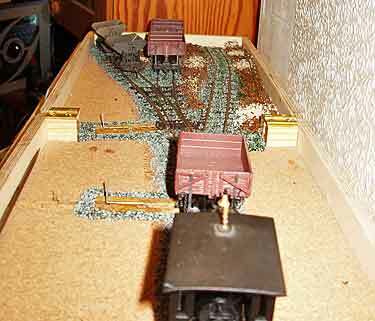 The width of the layout could be shaved a little if a left hand turnout were used to feed the loading dock and factory instead of the right hand turnout shown. The length can be shaved a little more if rolling stock length is limited to 40ft. 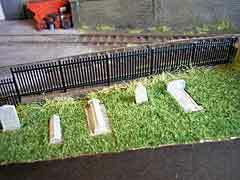 In HO scale using stock Atlas track components this basic arrangement should fit on a 10x48in platform. A 2in wide by 48in long head shunt cassette rounds out the design as a true 576sq.in. Micro Layout, assuming the footprint of the car ferry cassette is not counted. Of course, the layout could be shrunk even more if Peco short turnouts were used and if the plan were intended to accommodate rolling stock shorter than 50 feet long. A further refinement (above) uses a wye turnout to replace the #5 right hand turnout feeding the warehouse and loading dock. With this arrangement the length of the layout comes down by a foot to 6½ft. The warehouse and the factory loading docks become narrower, but side clearances in other places are eased. Following the current fad for building small layouts in IKEA snack boxes, Jack Trollope is building a small Inglenook style switching layout with a retractable sector table to act as the head shunt (drill track). The plan was designed (at left) by Diego de Bunder, from Puerto Madryn, Patagonia, Argentina, to fit in a snack box. But Jack discovered that his “local” IKEA store (200 miles away) was out of stock! So he made a substitute baseboard of the same size, pictured here. 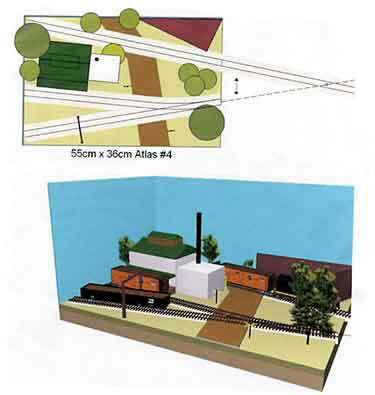 The over-all shot (above) demonstrates that the layout will hold 50ft cars in a 3-2-2 formation, with a loco and two cars on the sector table. The sector table itself plugs into and out of a retractable arm. 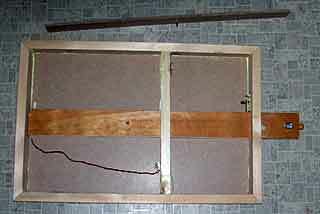 The photos (below) show the pivot arm closed for storage (left) and open for business (right). The prototype snack box measures 22×11½in (56x29cm). The industry (suggested by Diego) that Jack is planning for his line to serve is the Klassic Pickle Factory from Model Power — a dilly of a choice for a snack box. All in all, a delicious layout idea! WHAT A CURRICULUM! BUILDING A LAYOUT IN SCHOOL! Inspired by Colin Peake’s work (shown at the top of the page) Thomas Sieben, a schoolteacher from Krefeld, Germany and a group of his pupils built a small 3-2-2 Inglenook in three open days at school. In the photo Thomas and his students, aged 9 to 12, show off the layout. They are, from left: Marlene Kohrs, Anna-Sophie Focke, Nemo Haag, Paul Hurdalek and Ansgar Blauth. 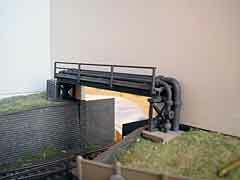 The layout, called Speckmanns Im- und Export, measures 40x30cm (16x12in) and is HO scale. The young people enjoy operating it as much as building it, often setting up competitions based on the switching puzzles.